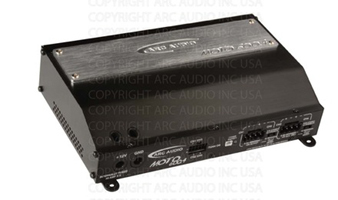 Designed specifically for the motorcycle and power sports market the MOTO 600.4 amplifier is the high performance solution for today's extreme music lovers. Capable of over 600 watts at 4 ohms across 4 channels the Moto 600.4 takes your factory stereo from zero to hero in a single package solution. Compact, elegant, and yet full of unmatchable power the Moto 600.4 is small enough to fit inside the factory fairing of all 2000 - 2015 HD full fairing motorcycles without the need of modifications, custom installations or devaluing your motorcycle. Its compact size allows you to achieve that personalized "Big Sound" without the loss of valuable bag space. Remote location status indicator lead for easy relocation of the amplifiers onboard diagnostics indicator. MPAK Includes all of the following products which are designed, test fitted and optimized for operation with your Harley Davidson Motorcycle. This kit includes everything you will need for step by step installation of a complete upgrade of your factory stereo system, while retaining your motorcycles factory head unit. The HD Motorcycle Wire Harness was designed by trained factory Harley Davidson Technicians at Mitchells Modesto Harley Davidson. The kid was designed in consideration of retaining you motorcycles factory electrical warranty. The HD Motorcycle Wire Harness was designed by trained factory Harley Davidson Technicians at Mitchell's Modesto Harley Davidson. The kid was designed in consideration of retaining you motorcycles factory electrical warranty. Ultra compact chassis design allows for installation in small vehicles and inside the factory fairing of most HD brand motorcycles. Class H switching design allows for maximum sound quality, performance and reliability without distortion and lack of performance of digital Class-D amplifiers. Wide band over voltage protection allows for continued use without interruption from very high voltage spikes that can happen with stator based charging systems. Hi Level speaker inputs for OEM application and integration from most factory radios allowing you to retain all of the factory steering wheel/handle bar controls and features.